Everything you need to outfit your LR3 for towing in one convenient and cost-effective kit! This trailer wiring kit and tow package are designed specifically as a complete, cost-effective bolt-on towing solution for 2005-2009 LR3 vehicles. The Atlantic British exclusive LR3 bolt-on hitch features a Class III rating (5,000 lbs. Tow Weight & 500 lbs. Tongue Weight). Atlantic British Trailer Wiring Harness: This seamlessly integrates with your LR3 wiring plug to provide a standard 'Flat 4' North American spec towing solution. It features an exterior cap to protect your trailer plug from the elements and easy plug-and-go installation means it can be installed in minutes. Stop and turn functions rated for up to 5 amps. Taillight function rated for up to 6 amps. 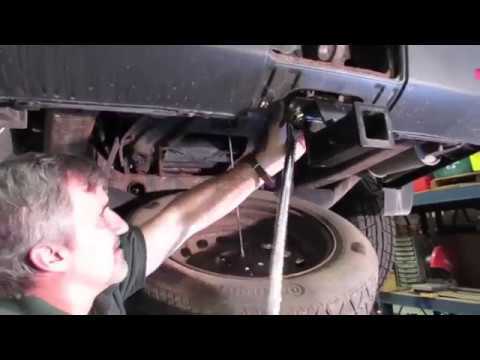 Atlantic British Ltd. Repair & Maintenance Academy How-To Video: Watch, Doug, our Land Rover Master Technician, discuss the installation of the bolt-on trailer hitch receiver, Part # LR019990ABP, for all late-model Land Rovers including LR3, LR4, Range Rover Sport and Range Rover Sport Supercharged. Doug will give the correct torque specs that are important for the proper installation of this hitch receiver. Questions about this video? Call us at 1-800-533-2210 or contact us via live chat. I haven't been able to hook up a trailer yet but the hitch appears to have high quality welding, and installing the wiring harness was a simple 15 minute job. This kit includes everything you need to be able to tow with your LR3. Installation was pretty easy with the help of the tech videos. Can easily be fine with hand tools and basic knowledge. Just be aware you absolutely need a torque wrench. But that can be borrowed from most auto parts stores for minimal cost or even for free. Parts are very well made and the kit even includes zip ties and foam to protect and the down the wires. This product will not stay tight. I've taken it to a Land Rover shop and had it torqued to spec. When I brought it in the guys at the shop said they didn't like the product and warned me that they see them often come loose. I've put my Kuat hitch mount bike rack on it and after a few days of driving the bolts came loose. I even bought my own torque wrench and have tightened it down a few times, but again after driving with a load on the receiver it comes loose. I'm workin on returning this part right now and will just shell out the extra cash for the Land Rover OEM receiver. This is a great product and I would highly recommend. The install was made easy with the provided instructions. Net result is great savings compared to having dealership equip vehicle for towing. Very pleased! Thank you to Atlantic British!!! This is a very good hitch. I installed the wiring harness myself which was easy to do with the instructional video. Took some maneuvering to git it to fit right but it soon did. I had the hitch installed at a shop because I did not have a torque wrench. I had them torque the bolts to the specified lbs. They still came loose, I re-tightened them tighter and so far so good. I would suggest using lock-tight when securing the main 2 bolts so they will not loosen up. Over all very happy with the product and super fast shipping. The products met my needs, and instructions made it easy for me to install. At first I really liked the design and how well installation was. I have been using it to pull an utility trailer. But today after a month I was pulling a uhaul 5x8 trailer empty and check the hitch at a stop and found the the receiver bolts were loose allowing the receiver to move around. I installed and torqued the bolts as required by the instructions. If the bolts wouldn't of had lock nuts I would have probably lost the trailer. I have retorqued the bolts and will watch closely. Needless to say I am nervous pulling the trailer now. We will see. This is a bit of an odd install. The video on the site skips a couple of crucial and time consuming details: where to run the wiring underneath and how to remove the dummy caps on the wiring. The unit is painted with a paint that even under the most careful installation or dry fitting will chip and expose the raw metal, I cannot imagine how badly that will rust. Other than that it is a good product.